You’ve put your business online, set up your blog or maybe an online news site, now what? Whatever the purpose of your website, attracting a steady influx of traffic is a lifeblood to your growth. If you do not know how to get more traffic, your website will not survive. Many people forget that website traffic means people visiting your site and engaging with you. In the end, without traffic, you will not achieve your goals, may it be generating more sales or gaining more popularity. But, how to get more traffic to your website? There are many ways to gain more visitors, but more than just increasing the number of your website traffic, it’s important to focus on amplifying the quality of your visitors, as not all traffic equates good traffic. When you increase the quality of your traffic, the better the chances of higher conversion and engagement. It is, therefore, vital that you attract qualified traffic. To help you do that we have carefully chosen a list of proven and creative strategies to get the right traffic for your website. Ready to drive overflowing traffic to your website? Online advertising is a fundamental strategy to attract more people to visit your site. If you’re really serious about growing your website, you must invest in paid advertising. Paid advertising has such a broad reach that you can definitely pay for traffic in any digital medium that you can think of. For this discussion, paid advertising is any website traffic that has been paid for to obtain it. Display Ads – a form of paid advertising on websites, apps or social media by using banners or other ad formats such as images, texts, videos, audios, etc. Display advertising increases traffic by 300%. An example of a display ad is shown at the page header. Paid Search – a way to list your ads throughout search engines and their other platforms. It is oftentimes referred to as pay-per-click (PPC) advertising because, with paid search ads, businesses can bid on an ad placement to display as a sponsored link on the search engine results page. Paid search ads appear at the top of the results page, giving it more chances to get clicked and can help drive 89% incremental traffic. First-tier search engines have PPC platforms like Google Ads and Microsoft Bing Ad. Social Media Ads – any type of sponsored content that appears on Facebook, Twitter, Instagram, Youtube, and other social media platforms. Social media ads traffic share has grown by 146% year over year. Each paid advertising channel has its pros and cons, so carefully plan your campaigns and calculate the ROI to assess what paid channel is a viable option for your website and budget. While you need to add paid search to your strategies, it is equally important to pay attention to your organic search by improving your overall search engine optimization (SEO) strategy. Amplifying your SEO helps in enhancing your website’s a website’s organic search engine ranking. SEO is designed to rank higher at the search engine results page by targeting search terms that most shoppers are looking for without having to pay for a search ad. Targeted Keywords. Carefully pick out keywords or search terms that are directly relevant to what your target customers are looking for online. On-page and Off-page SEO: Tastefully place your keywords on meta descriptions, page titles, headers, alt tags, URL structures, inbound links, linking root domains, etc. Over the past years, influencer marketing has gained enormous traction because of its cost-effective way to improve brand awareness and generate valuable interaction with your target audience. While there are a lot of social influencers out there, not all of them are suitable for your brand. Look for influencers within your niche. These niche influencers are the ones with significant followers who are respected by your target audience. For instance, if you are a makeup brand, look for popular and reputable makeup artists. Produce a live social media show. Set up a live video feed through the social influencer account. For instance, you can produce a live makeup tutorial session or product demonstration or live unboxing video powered by your website. Cosmeticary teamed up with a social influencer to produce a makeup tutorial session promoting its website and products. Send free product samples or freebies. If you are an online store, send your chosen influencers with freebies or product samples and then ask them to feature them on their social media accounts. Choose blogs not only by looking at their popularity but more importantly their credibility and relevance to your website. Look what blogs your target audience is reading and start from there. The good thing about guest blogging is it pulls new traffic to your website by taking advantage of the blogger’s audience. Aside from gaining more visitors, it helps in improving your SEO strategy because you can enhance your link building. Become a guest blogger. Identify blogs that complement to your website’s audience. Say, for example, you are a fashion website, look for lookbook blogs or stylish bloggers. Simply reach out to them by sending an email requesting for you to write a content that is relevant and useful to their current audience base. Invite others to guest blog on your site. Aside from posting contents to relevant blogs, you can also invite people like niche influencers to contribute to your blog posts. They are most likely to promote and share the link to their guest article. This means new traffic coming into your site. Question and answer (Q&A) format websites have significantly spawned over the years. To date, there are already 40+ websites following the Q&A format. The most widely known is Quora. 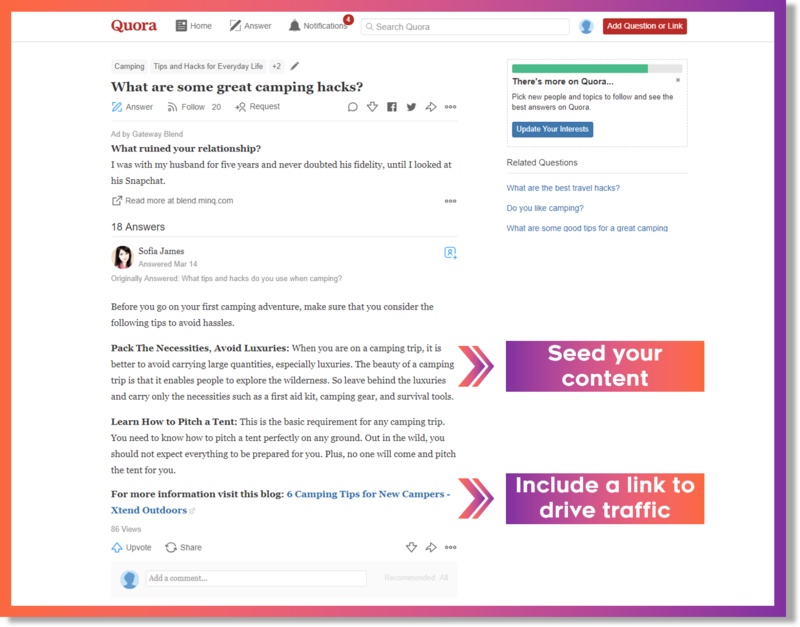 The simplicity of using a Q&A site attracts more website owners to seed their brand on the Q&A site and drive their readers to their own website. Users will just ask questions and others will try to answer them. Answer questions that attract your target audience. Find relevant questions that your target audience might be asking or interested in knowing. Try to provide informative and standout answers and then put a link to drive the readers to your website as a suggested solution. Anonymously submit a question yourself. Another trick is to submit a question yourself as anonymous and then answer it by seeding your content with your public account. If you want to use Q&A sites as a long-term strategy to get more traffic to your website, build an active account with credibility, high level of engagement, and popularity. Your current website readers, visitors or customers can potentially help you promote your website to their family, friends, and social media followers. The type of traffic generated from referrals have significantly higher quality because their family and friends may possibly share the same interests and persona. For example, if you are an online store, you can incentivize your customers to share their shopping carts via their social media account. This does not only build organic links to improve your SEO but also get more traffic to your website. The Clymb encourages visitors to refer them via Facebook or Twitter with an incentive. Email marketing is still one of the most effective channels to get more traffic to your website But traditional email marketing has evolved into a more sophisticated one called automated nurture emails. Building an email nurture helps in building and continuing that budding relationship. Welcome emails. Nurtures new sign-ups by sending an automatic welcome email. Site-wide recommendations. Send a personalized newsletter recommending products that the customer might be interested in based on their browsing and purchasing behavior. Retarget old traffic. It’s also important to leverage email marketing to retarget your previous traffic. You can send a cart abandonment email for all those customers who have added an item on their carts but leave without successfully purchasing it. 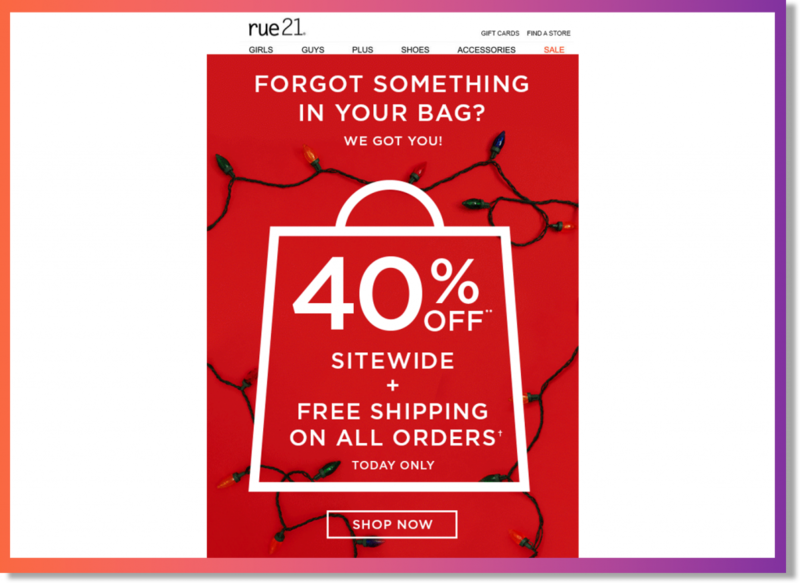 Rue21 sends a cart abandonment campaign to get previous visitors back to their website. Increasing your website traffic is more than just the quantity, but it’s more on focusing on getting the right traffic to your site. Our guide to attracting more traffic is aligned with your target audience’s intent in mind, giving you more ways on how to get more traffic to your website with quality as a priority. This will get you more opportunities to overachieve your objectives and grow tremendously.